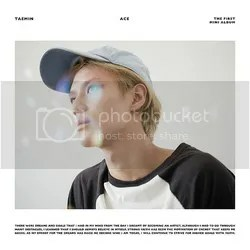 ACE is the debut solo mini-album by South Korean singer and SHINee member Taemin, released on August 18, 2014. The mini-album peaked at #13 on the charts and has sold 5,105 copies. Taemin’s debut has been requested by a lot of people, so here you go guys! I didn’t expect the opening and title track Ace to be this sultry slow song, but hey, Taemin surprised me more often lately. I enjoy the parts in the chorus when Taemin sings ‘I want to be your only ace‘, his vocals have improved so much and he puts the right amount of temptation in them here. That’s exactly the way to describe this first track: temptation, seduction, to lure you into the album, and Taemin has succeeded very well with that. Goedo (Danger) serves as the lead track for the album and it sounds very, very good! Am I the only one who thinks some of the hooks are slightly comparable to Michael Jackson vibes? Either way, this song is catchy all the way and again Taemin shows a whole other side of his vocals, much deeper and more energetic. Fun track! An introduction that is very western movie worthy opens Experience, it gives the track a mysterious and unique quality that is very memorable. To me, it sometimes seems as if Taemin’s vocals are lacking a bit, but that could very well be his own breathy sound (since I’ve heard it before). The only word to describe this song in one word is: catchy. Not the best, but certainly unique. I really liked the opening for Pretty Boy (feat. Kai of EXO), and the overall sound is exactly what this album needed: something close to hiphop music. Kai spices everything up while Taemin sounds more like Jonghyun here, confusing right? Anyway, even though Taemin sounds like he’s trying to imitate his fellow SHINee member, this must be the best song I’ve heard on this mini-album yet! Let’s get quirky with some swing and doo-wob! Geojeolhalge (Wicked) is the next surprise on this amazing mini-album with a completely new sound and the perfect vocals to match this style. I do think this song missed a big explosion of sass and attitude, but somehow the part near the end is close enough to what I actually wanted. Very unexpected, but very welcome. I’ve heard Sonata (Play Me) before, maybe because one of my friends played it for me once. It features Taemin’s higher pitched vocals and his vocals are actually the highlight of the entire song. The music is very minimal and almost non-existing, so in some way this song is not that special. Maybe it needs to grow on me, but for now the rest of the album is much better than this last track. I must say that when it comes to reviewing this mini-album, I wasn’t that exited in advance. Taemin was always my least favorite SHINee member since he was originally the group’s dancer and Jonghyun and Onew were always the better singers. Somehow Taemin erased some of my doubts and he showed me he can actually sing and release a nice and catchy album! Most of the songs were very memorable and unique in their own way, there was much variation and that’s why I just throw my hands up now and give some of my live to this young singer. Well done! Thanks for the review, Jade! I have to say this album was so-so. Taemin has never been my favorite, either, I like everyone else over him…besides Minho. Anyway, on to the songs, which were pretty weak, the best ones were “Pretty Boy” & “Experience” “Danger” was repetitive, and the other two were boring. It was a nice try though. Maybe if he releases another solo album it’ll be better.